Storyboard - 00222.swf - [S] Rose: Play a haunting refrain on the violin. 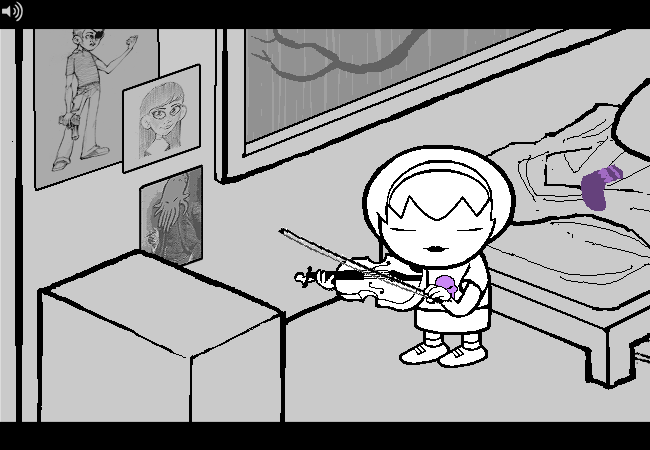 This is a readmspa.org storyboard for 00222.swf, as featured on Homestuck page 002122: [S] Rose: Play a haunting refrain on the violin..
Soundtrack: Aggrieve , as a refrain for solo violin. Same shot as previous page. Rose, with eyes closed, plays the violin. She has it tucked under her chin, holds the bridge with her right hand, and bows with her left. Falling rain is visible through the long window behind her — lightning flashes occasionally.